Manchester (United Kingdom) (AFP) - Army experts blew up a suspect package at Old Trafford on Sunday after tens of thousands of fans were evacuated from the stadium ahead of Manchester United's final English Premier League game of the season, police said. The emergency was signalled just 20 minutes before the scheduled start of the game in the 75,600 capacity stadium. United and Bournemouth players were warming up on the pitch when the club ordered fans out of two stands. The game "has been abandoned, fans are leaving the ground. Please avoid the area if possible", Manchester police said on their Twitter account. Army specialists were called and police later announced that "a controlled explosion has just been carried out within the stadium by bomb disposal experts at Old Trafford". There was no immediate word on whether the device was a bomb. A United spokesman said the suspect package was found "in the North-West Quadrant of the ground" at the Stretford End and that the match had to be abandoned. Inside the stadium, announcements were made on the public address system that security staff should invoke "operation red code". 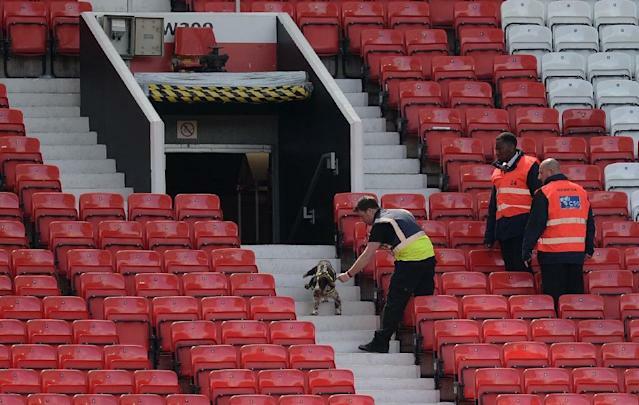 There was no panic inside Old Trafford, one of the world's most famous sporting venues, as half of the stands were evacuated. Public announcements instructed supporters in the South and East Stands -- including travelling Bournemouth fans -- to remain in their seats before the game was called off. "We're still in the dressing room, seems we'll be the last to leave. There's been nerves and tension," Britain's Daily Mirror, citing Spanish radio, quoted United midfielder Ander Herrera as saying. 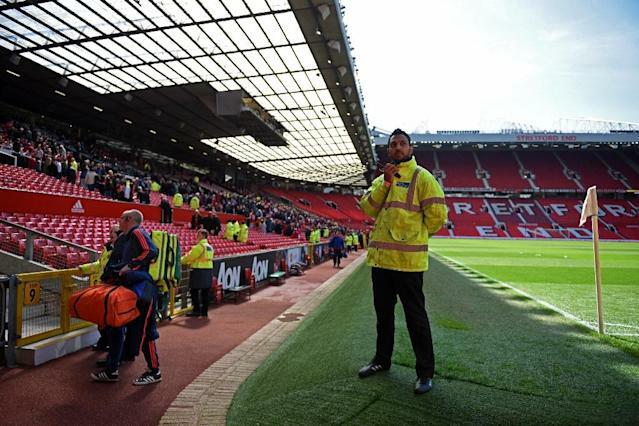 It is the second time in less than a week that Manchester United have been involved in a security alert. Their game at West Ham United on Tuesday was delayed after their team bus was attacked by home fans. Louis van Gaal's side went into Sunday's match seeking a victory that would give them a chance of finishing fourth, and thus qualifying for next season's Champions League, although Manchester City's 1-1 draw at Swansea has made that eventually almost impossible. There was no initial indication of the seriousness of the incident but by the scheduled 3:00pm kick-off (1400 GMT), stewards outside the ground were telling supporters that the game had been abandoned and, within minutes, the decision was confirmed by police. People who remained inside the stadium were told to stay in their seats "while the forecourt is cleared of fans already evacuated from the stadium". The club held up announcing the decision to fans remaining in two other stands for another 10 minutes, to avoid congestion outside the ground. 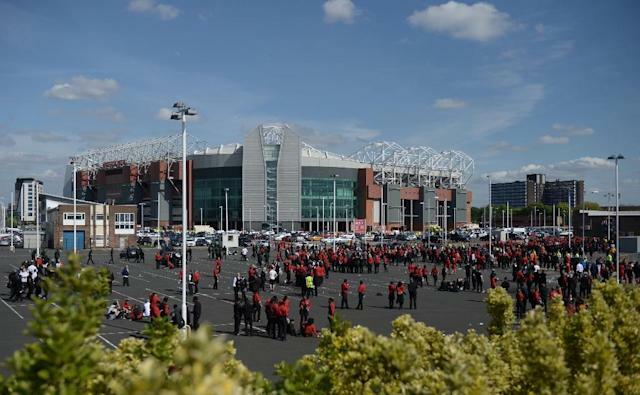 By 3.15pm, the remaining parts of Old Trafford were evacuated. 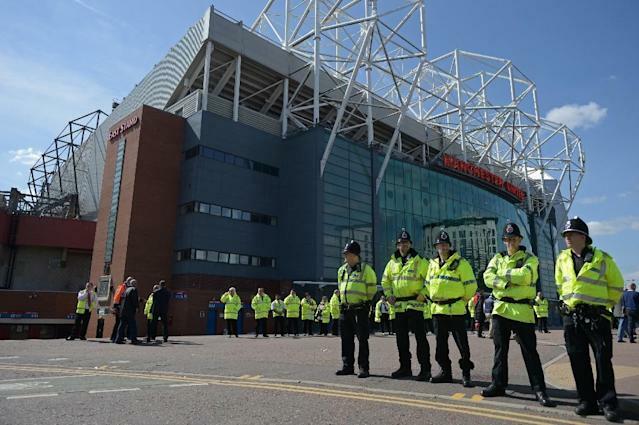 Soldiers from the British Army's 'bomb squad' were then sent to Old Trafford. Assistant Chief Constable John O'Hare of Greater Manchester Police said: "We are doing everything we can to investigate this item as quickly as possible, however our priority is obviously to ensure the safety of everyone in the stadium and surrounding area. "As a result, today's game has been abandoned and a controlled evacuation of the stadium has now taken place." He added: "We are awaiting the imminent arrival of military colleagues to come and support us and establish what exactly we are dealing with." With Manchester United playing Crystal Palace in Saturday's FA Cup final at Wembley, it may be more than a week before the Bournemouth match takes place. A statement issued by the Premier League said they would "seek to rearrange the fixture as soon as practically possible and will advise fans accordingly". Although Bournemouth are safe from the threat of relegation and cannot qualify for Europe, Sunday's match was not without significance for the south coast side. Eddie Howe's men, who started the weekend in 16th place, were looking to completed a league double over United, with the amount of prize money they receive dependent on where they finish in the table.